WELCOME from everyone here at The Cat House Feline Sanctuary, Inc.! http://www.petfinder.com/shelters/OH591.html and think of bringing home a new family member today! We make appointments for visits on an individual basis as some of our cats are in our facility and some are housed with foster families. To make an appointment, please contact the person listed in the description of the cat of your interest. To provide a sanctuary for unwanted cats and kittens in Ashland County, Ohio. All of our cats are spayed/neutered, vaccinated for feline leukemia, distemper, and rabies as well as tested for feline aids (FIV) and feline leukemia (FELUK), wormed and flea treated. They are also treated for all prevalent illnesses while in our care. We have a wide range of cats looking for new homes. We have a variety of ages from kittens, adult, and senior cats. We have long hair, short hair, a variety of colors, some de-clawed, males and females, as well as siblings. We also have a few special need cats, so we are sure that we can find the right match for your family. Our sanctuary is an open environment, and we do not have our cats in cages. They are all free roaming, able to interact and socialize with one another. This helps us get to know them, their personalities, who gets along with whom, and behaviors. This helps us match the right cat with the right family, to help insure a purrfect relationship! We also have the policy, and it is stated in the adoption contract, that if for some reason you cannot keep your adopted friend from our sanctuary, we will always take our cats back. We understand life has its twists and turns, and whether it is 10 days or 10 years from adopting on our our cats, you can always bring it back here if you are unable to care for it any longer. The Cat House Feline Sanctuary, Inc., was established in 2003, as a non-kill shelter for a limited amount of cats in a need of a sanctuary until they can be adopted into loving, permanent homes. In 2007, we became a 501(c)(3) non-profit organization. During 2007, through donated labor and building supplies, The Cat House was re-weatherized to provide a warmer, more energy efficient shelter during the cold and snowy months. In 2008, an increase in the number of homeless cats and kittens in Ashland County, resulted in The Cat House being over capacity. The Cat House was expanded to meet the growing need thanks to grants from the Ashland County Community Foundation and the Kenneth A. Scott Charitable Trust. We were able to expand our main building roof and make an exterior, chain link fenced in area for our cats to be safely outside for exercise and play. Creating more overall comfort and space for our cats. As the homeless/abandoned population of Ashland County cats continued to grow, we knew we needed do our final expansion. Thanks to the Pepsi RefreshEverything project in 2010, we competed through online voting, for a $10,000 grant to double our sanctuary space. With an outpouring of community and online support, our sanctuary placed 3rd among hundreds of other shelters across the nation. An additional $5,000 grant was secured from the Ashland County Community Foundation, and our construction began in the late fall of 2010, and finished in the spring of 2011. In 2012, through fundraising and donations, we built our small 6 cat infirmary, into the last open space in our main building. Our capacity can now comfortably house 100 cats. We remain one of the only 501©(3) designated, cat exclusive, no kill sanctuaries in our county of Ashland Ohio. We are always at capacity, and we are only able to take homeless and abandoned cats/kittens from Ashland County. We are unable to help every cat that needs our care, so remaining true to our community cat’s needs, is our goal. Through our adoption program, as cats are adopted, and our numbers come down into reasonable limits, we are able to take more kitties in need of our care into our sanctuary. Our volunteers, foster homes, financial donations, fundraisers, and support of our local community are all vital to our existence. 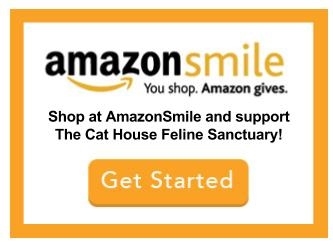 The Cat House - Feline Sanctuary Inc.